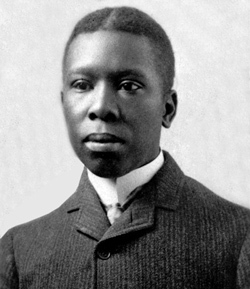 Paul Laurence Dunbar (June 27, 1872 – February 9, 1906) was the first African American poet to become nationally known. His books of poems include Oak and Ivy (1892), Majors and Minors (1895), Lyrics of a Lowly Life (1896), Poems of Cabin and Field (1899), When Malindy Sings (1903), and Lyrics of Sunshine and Shadow (1905). His works of fiction include The Uncalled (1898), Folks from Dixie (1898), The Strength of Gideon (1900), and The Sport of the Gods (1902). He also wrote the lyrics for In Dahomey, the first musical written and performed entirely by African Americans to appear on Broadway. Dunbar moved to DC in 1898 to take a job at the Library of Congress. He married another writer, Alice Moore Dunbar-Nelson, that same year. In 1900, diagnosed with tuberculosis and alcoholic, he left the area to try to regain his health. He returned to DC only briefly, then moved into to his mother’s home in Dayton, OH where he died in 1906 at the age of 33.